You’re dedicated to achieving greatness. You’re driven to get the most out of yourself. You’re committed to optimized performance and productivity. You’re a peak performer — executive, entrepreneur, and/or athlete. To stay on top, you need to function at your best. Your health is the foundation on which you build your best life. That’s where I come in. I’ll show you how to do less and be more. Obtain a joyful brain. Happily inhabit your body. Sustain peak performance. I’m a Wellness Coach, Medical Massage Therapist, researcher and health advocate dedicated to helping you up your game, physically and mentally so you can sustain peak performance; and avoid burnout. Discover a new way forward. Thriving mind. Healthy body. I’ll show you how. Thriving Mind. Healthy body. Lovin’ life. Rewire your brain. Calm your mind. Reset your nervous system. Private coaching programs to successfully make positive changes in your life, health, relationships, career and well-being. Learn proven strategies to transition from the stress and intensity of “being on” to a restful state; resulting in a calmer, clearer head, more focus and greater productivity. Unhook the belief systems that have kept you stuck in the past. Discover how to show up for yourself 100% without neglecting everyone you care about. Reduce inflammation. Alleviate tension and pain. Increase flexibility. Full-scale bodywork sessions to evaluate and release the lines of tension in muscles, diaphragms, joints, ligaments, fascia, lymphatic and the CranioSacral system to improve circulation, mobility, and flexibility. Overall function is improved by addressing the origin of pain and dysfunction leading to greater workout performance and faster post-workout recovery. Build core strength. Correct posture. Increase mobility. Customized fitness programs to build a more balanced musculature, create healthy, happy fascia, and eliminate pain caused by poor posture and muscular imbalances. Radically improve your health. Eat to thrive. Live with more joy. Learn (sustainable) healthy-living habits to reach your goals far more quickly with fewer roadblocks to your success. Take your mind and body health to a whole new level with therapeutic nutrition. 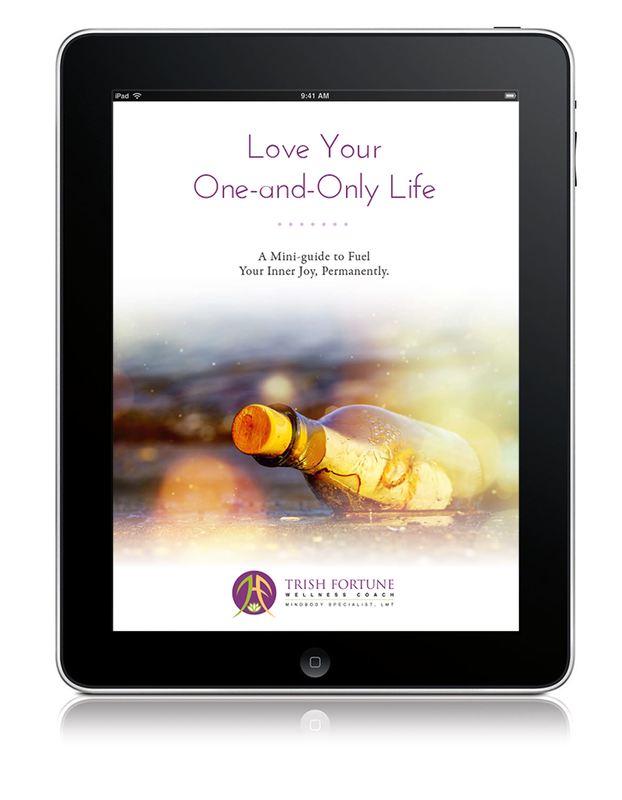 Implement proven methods for lifestyle transformation to deepen your connections to those you love, feel more fulfilled and show up in life the way you have always wanted. Trish has over twenty-five years of knowledge and experience in the areas of health, healing and wholeness. Her holistic model of health is based on a fusion of mindbody therapies, fitness counseling, rehabilitation and corrective posture, nutritional consulting, plant-based cuisine, bodywork and massage therapy, life coaching, health education and Eastern methodologies. She implements proven tools and strategies based on cutting-edge research and real-world application. It’s your time. Let’s do this! Your life is too precious to turn the key to your happiness over to someone else. This is your one-and-only life. Choose to live from a place of joy; and see the goodness in everything. I’ll show you how. Sign up for my newsletter and receive your free 28-day guide to fuel your inner joy permanently. Get a jumpstart on your health and vitality in as little as three day. Destress and relax your mind and body. Experience an energy reboot sans caffeine, processed sugars and artificial stimulants. Improve your body’s natural ability to heal (a.k.a. immune booster). Make healthy living a lifestyle. It’s time for you to feel, see and experience the difference in your health and vitality. Sign up with your email address for real talk, recipes, tips and guidance for creating lasting, lifestyle changes to support your health and optimal well-being. We respect your privacy and will NOT share your email address with any third party companies or organizations.